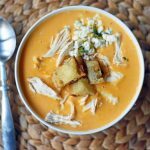 Creamy Buffalo Chicken Soup with all of the creamy, tangy, and spicy flavor of your favorite chicken wings but in a soup! My family is obsessed with wings. It all starts with my husband. If he ever goes on a diet, he asks to splurge on wings and ribs for his last meal. If he ever takes the boys on a “guys night out” they always order wings. If I am ever out of town on business, they order wings. You are probably getting the picture by now. They love themselves some chicken wings. Guy Fieri, from Food Network, is one of my favorites and his food is always over-the-top delicious. He is always bringing the intense flavors! I saw him make a Buffalo Chicken Soup and I knew that it had to go on our dinner menu. It was everything I wanted it to be but needed a little more wing flavor. I am tweaking the recipe and sharing it with you! 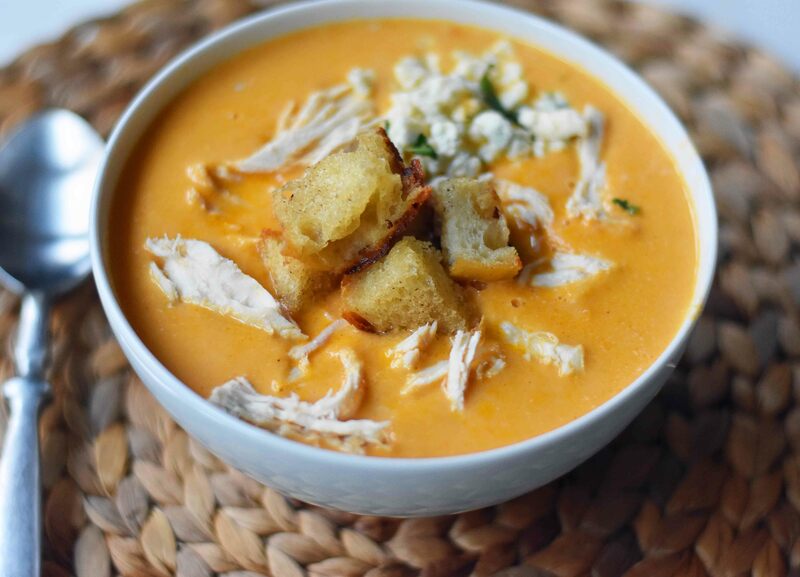 This Creamy Buffalo Chicken Soup is made with everything you love about wings — the robust flavor of the wing sauce paired with the freshness of carrot and celery sticks dipped in blue cheese (or ranch) dressing. This Creamy Buffalo Soup starts off with sauteeing onion, carrots, and celery in butter until softened. This is going to bring out the rich flavors of the vegetables and add some freshness to the soup. Chicken stock is added to give it a depth of flavor. This is a good time to puree in a blender or by using an immersion blender. This creates a silky smooth creamy soup. Once the soup is pureed, bring it back on the heat and add the heavy cream. The Frank’s Hot Sauce or Wing Sauce is what gives it that perfect chicken wing flavor. 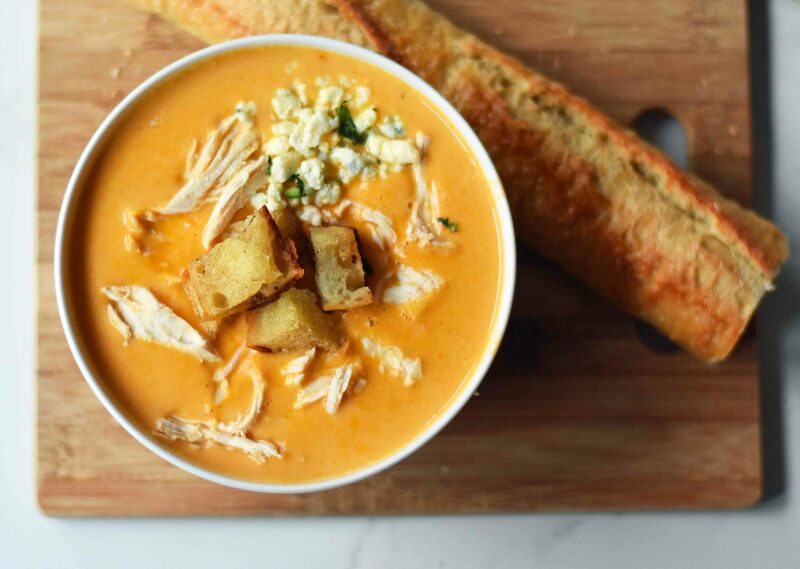 I am salivating just thinking about this soup and want a bowl right this very second. You may use any type of chicken you desire — pulled chicken meat from a rotisserie chicken or poached chicken. If you want to know how to make tender, poached chicken that shreds easily, just follow the easy directions below. Place chicken breasts in a pot and cover with water. Sprinkle with some salt and any other seasonings you desire. Bring water to a boil and once the water has reached the boiling stage, quickly reduce to a simmer at low heat. Cover and allow to cook for 10 – 14 minutes or until chicken is no longer pink. Remove chicken from water and shred using two forks. 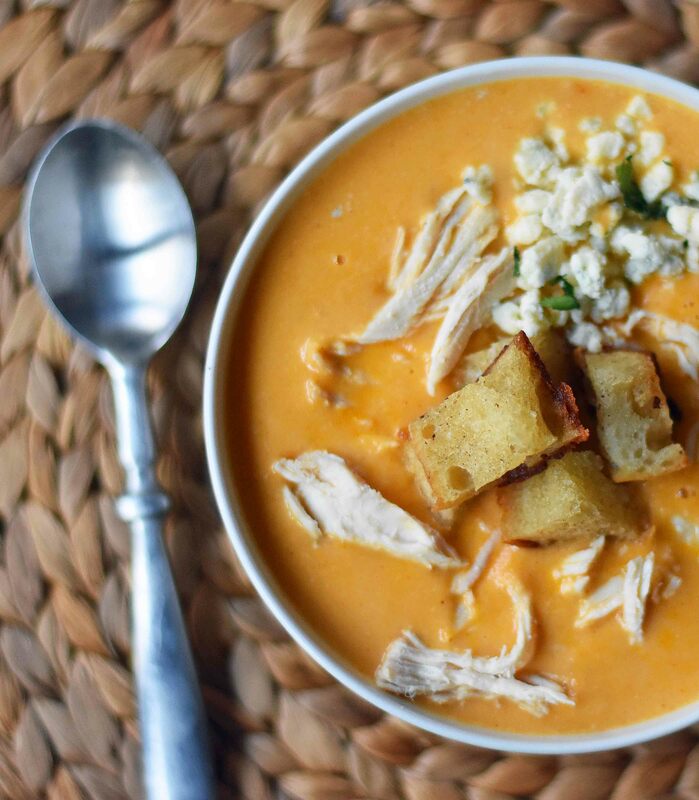 This Creamy Buffalo Soup can be topped with blue cheese crumbles (if you dig it), sour cream, green onions, and homemade croutons. 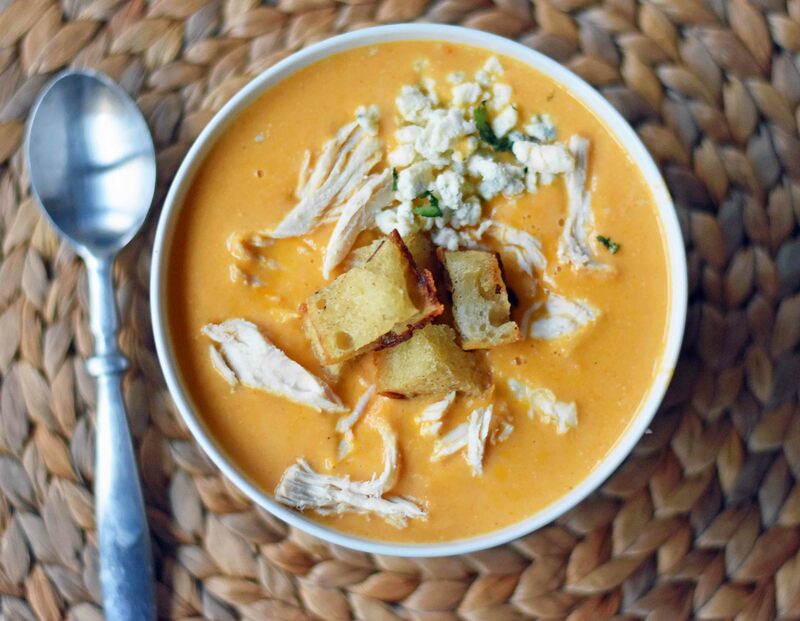 The croutons are ridiculously good with this soup! 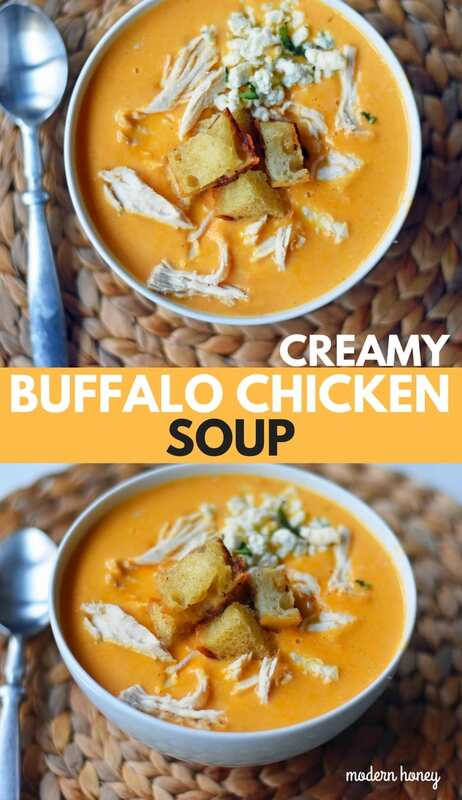 Creamy Buffalo Chicken Soup with all of the flavor of chicken wings in one soup! To make soup, heat a large pot over medium heat. Add butter, carrots, onion, celery, garlic, salt, and pepper. Cook for 5 - 7 minutes, until vegetables become tender. Add the flour and cook for 5 more minutes, stirring often. Pour vegetable mixture and chicken broth into a blender or use an immersion blender and blend until smooth. Return to pot and add heavy cream and hot wing sauce over medium heat. Bring to a boil and then reduce heat to a simmer. Let simmer for 30 minutes. Add pulled chicken and heat for 5 minutes. To serve, ladle soup into bowls. Top with garnishes of choice -- sour cream, blue cheese, green onions, homemade croutons. In a medium saucepan, melt butter and olive oil. Add the bread cubes to the pan and stir to coat. Cook until golden -- 6 - 8 minutes. Season with a sprinkle of salt. Serve on top of the soup. Thank you for posting this. This soup is wonderful, and I have made it 3 times this winter, and plan to make a crock today for lunch. I am partial to Anchor chicken wing sauce so I use that instead of Frank’s. I also threw in a packet of ranch dressing seasoning. The green onion garnish is a masterstroke. Seriously, who doesn’t love green onions?